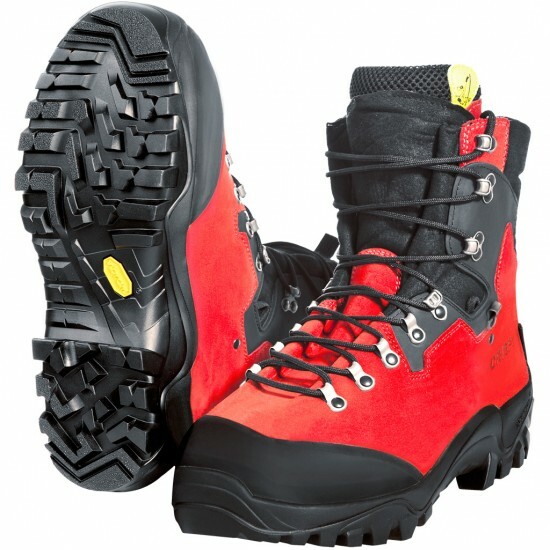 Klima AIR Zermatts are the absolute number one in premium quality chainsaw boots. Designed for arborists and tree climbers, the Klima AIR Zermatt is a lightweight, Goretex Lined, waterproof chainsaw boot which offers excellent strength and comfort. Hard wearing non-slip Vibram Soles ensure better grip when limb-walking and is excellent for spiking. Made from a single piece of leather, for added strength. Klima air Zermatt chainsaw boots have aluminium toe caps and Kevlar midsoles for excellent protection whilst keeping the weight down. Waterproof and breathable Goretex inner membranes ensure dry feet for maximum comfort all day. Double stitched at key areas for strength.